As anyone who knows me will attest, my desk looks like an archeological site. It’s time to get organized and this mail caddy is a perfect start. 2. To assemble the caddy box, add a line of hot glue along the 6″ side of the base piece and press the 6″ inch side of another 4″ x 6″ piece at right angle to the base. Do the same on the opposite side of the box. Add a line of hot glue to all three sides of one open end and press one of the 4″ x 5-1/4″ pieces into place. Do the same on the opposite side. You should have an open box. 3. 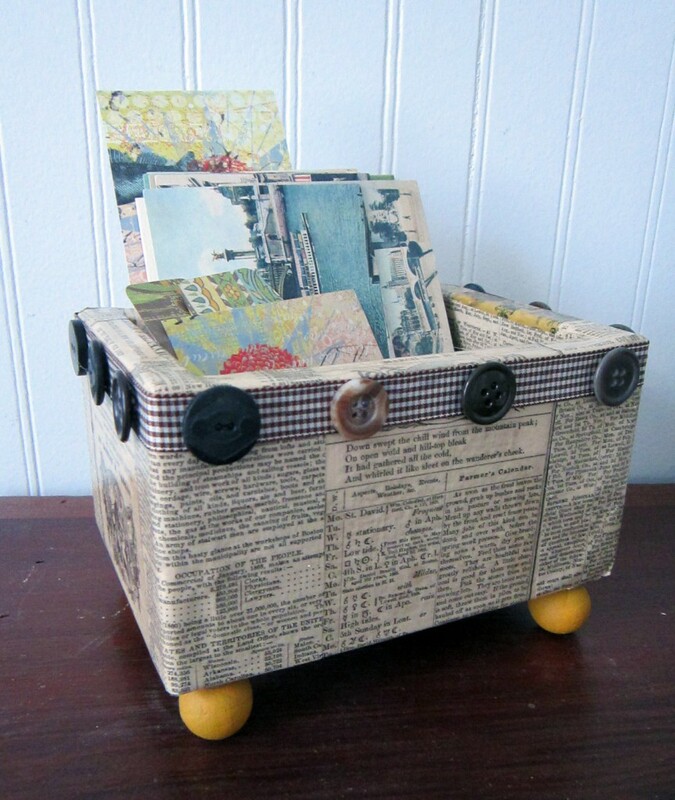 Decoupage newspaper or book paper across the surface of the box, inside and out, using the decoupage glue and a sponge brush. I poured a little of the glue into an old plastic container to make it easy to use. My caddy was decoupaged with pages from a 150 year-old Farmer’s Almanac I had picked up at a flea market. Allow to dry. 4. With a clean sponge brush, brush on a layer of the paper glaze across the entire surface of the box (except not the bottom). Allow to dry thoroughly. 5. Stick a toothpick into each ball to use as a handle for painting the ball. Use a scrap of the Smoothfoam sheet to stick the toothpicks into, to allow the balls to dry. Apply 2 coats of paint, allowing it to dry thoroughly between each coat. 6. To add the balls to the bottom of the box as feet, measure 1/2″ in on each corner of the bottom and make a little mark. Add a dot of hot glue at each X and adhere the feet into place. 7. Cut the ends of your ribbon at an angle to prevent fraying. Use Tacky Glue along the top rim of your caddy and adhere the ribbon into place. Allow to dry. 8. Use hot glue to embellish the rim of the caddy with buttons. Note: I received payment in cash and materials from Smoothfoam to create this post.